Successful yard sale shopping starts well before any of the sales do -- and not just because you're an early bird. For serious, savvy shoppers, the secret is planning a smart yard sale route each weekend. To do that, you have to pick the best yard sales for your route. Checking your local yard sale listings is the first step in planning your route. You'll find them in the newspaper classifieds, as well as on Craigslist and your local Facebook online yard sale groups. For each sale, start by reading the merchandise list (if there is one). Pay attention to the types of merchandise listed, as well as the order in which they are placed. Sellers tend to list what they have the most of or what they think is the most desirable first. Depending on what's on the merchandise list, you may choose to keep that sale as the maybe or add it to the definitely don't go list. For example, if the entire list is baby clothes and toys, it's probably a no if you're shopping for vintage Pyrex and Bakelite bangles. If it's a maybe, you need to do more investigating. If you're a yard sale regular, you probably have a few neighborhoods you tend to favor. Shopping by neighborhood is a quick and easy way to plan your yard sale route, but you shouldn't exclude sales in other neighborhoods without at least reading the listings. As you read yard sale ads for neighborhoods where you don't usually shop, you'll occasionally find a phrase that hints at merchandise you don't normally find there. It might be as simple as a listing that mentions four generations of family gathering to hold a garage sale. Or, the seller might say something about selling her late grandmother's clothes and household goods. You can't rely solely on the written text in yard sale listings. Some sellers are great at writing garage sale ads, but their merchandise isn't so great. Fortunately, today's technology lets you take a sneak peek at many yard sales that weren't available for previous generations of yard sale shoppers. Both Craigslist and Facebook let sellers include numerous merchandise photos with their listings. Many newspapers have that option as well. Even if you have the paper delivered to your doorstep each morning, go ahead and check your paper's online version. You may find photos of the yard sales when your print copy only features text. If you tend to include estate sales on your yard sale route, you can find lots and lots of merchandise photos of most listed sales on estatesales.net and estatesales.org. If you sign up for sale alerts in your area, they'll even email the listings to you. If you do find photos, don't settle for the thumbnail versions. Click or right click (or whatever your site advises to view larger versions of the photos or view them on a separate page. Then, enlarge your browser setting as much as you can without losing clarity. Once you've got yard sale photos as large as possible, look closely at every inch. You may spot merchandise you absolutely must have -- or you may realize the sale isn't even worth adding to your list. Choosing the yard sales on your route based on neighborhoods is pretty effective if you live in a large city where different areas have majority populations of the same age, stage of life, or income level. For example, if you're shopping for children's clothing, toys, and furniture, your best bet is frequently new construction subdivisions full of young families. Within that criteria, you'll find the best quality in middle-middle class and above subdivisions in good school districts. For good quality newish furniture and adult clothing, plan your route in upper-middle class and above neighborhoods with owners of any age. When you're looking for antique and vintage merchandise (clothing, furniture, housewares, holiday decorations, etc. ), older neighborhoods are better if the houses haven't changed hands for many decades. For good antiques, upscale older neighborhoods are frequently the best, but elderly sellers of even modest means may have vintage goods that are considered collectible today. Consider vintage Christmas ornaments, for example. Those Shiny Brite ornaments that go for quite a bit on eBay these days were just inexpensive five-and-dime store purchases when they were new. If your city's sales aren't divided by distinct neighborhoods -- or even if they are -- check to see if the the tax assessor's office in your county makes the property tax available online. If so, you can gain a lot of helpful information by plugging sale addresses on your maybe list into the site. The public information on your county tax assessor's website usually includes when the house was built, who owns it, and how long it has been since it was sold. You may also find the square footage, amenities, and whether or not the house has an attic or basement. If you compare the physical address to the address where the tax bills are mailed, you can usually tell if the home is being used as a rental. That's useful information since rentals tend to have shorter term residents than owner-occupied homes -- and people who have been in place longer are more likely to have spent decades storing their extra stuff. If your county's property tax records aren't available online, you can learn a lot by entering an address into your search engine. The first page of results typically includes information on the home from numerous real estate websites, even if the home isn't for sale. Those listings frequently include the year the home was built and the year it was last sold. In addition to real estate information, you can use Bing or Google Maps to look at street view images of the home. Seeing the home gives you some idea of its age. Seeing the home and others on the street give you an idea of the wealth or poverty of the neighborhood. If you're not keeping notes on every yard sale you attend, it's time to start -- even if you're not a picker or dealer buying for resale. In addition to recording information on the yard sales you attend, note the addresses and dates of sales you skip if they take place in neighborhoods where you might attend in the future. Keeping yard sale records may seem like a lot of work, but it doesn't take that much time if you do it at the end of each shopping trip -- and the effort pays off. 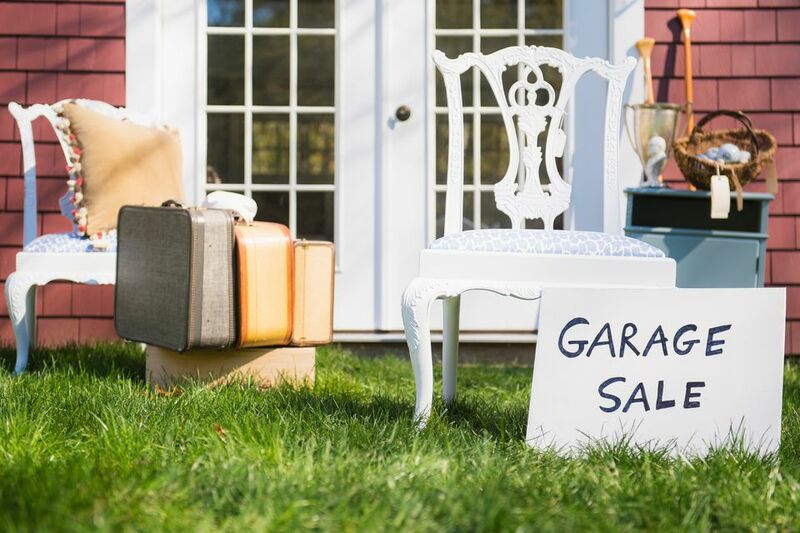 Next season when you're trying to decide whether or where to place a sale on your yard sale route, your records from this season may very well give you your answer.